The MAKO Spearguns Mini Dive Light is a powerful compact dive flashlight offering amazing brightness for such a small light. It operates on a single replaceable AAA battery, offering an amazing 120 Lumens with extended run time. The Mini Dive Light is completely waterproof up to 120 meters, and turns on/off with a simple twist of the end cap. It also includes a mask strap attachment clip which makes this dive light very popular among competitive freedivers, freedive instructors, spearfishermen, and scuba divers too. Need a 2nd light? Don't order quantity 2! Be sure to check my 2 Light package deal in the drop down menu above! Does the job. Not super bright but it's what you would expect for a light that size. 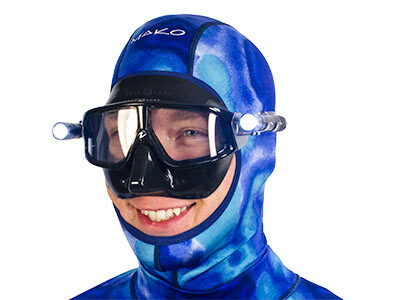 One huge advantage though is that it keeps me nice and visible for my diving partner in the Pacific Northwest. We have cold dark murky water so I use it for safety more than anything. 5 stars. Haven't used it at depth yet, but it's a great idea. This light is tiny, throws a strong narrow beam and rides unnoticed on my face mask. The beam is narrow and focused. When it arrives there is a barely visible wrapper on the battery. Remove it before use. I thought mine was dead. It just needed unwrapping. A trick attributed to William Truebridge that I learned from Nick Fazah is turn the light on. Then back off the knob until the light just turns off. When you dive the water pressure exerts enough force to close the contacts and the light turns on automatically. This maximizes battery life and makes operation a non event.